I used the local crit course Ault Park) and did 5 minutes at time trial pace and then 1 minute and power interval x 5 with a few minutes between. The instructions were to use a flat road and not a hill. Ault has a slight climb on each lap and a slight decent so its good for working on maintaining power going up and down. Power was 351/436, 352/423, 352/426, 346/425, 344/423. Had rested on Sunday and most of Monday. I did participate in my 55 minute circuit class last night. Didn't seem to have any negative effect today. More of these on Thursday. On Saturday I rode with a guy I'm training for the Louisville Triathlon this summer. We did the 100 mile ride to Ripley, OH and back on Saturday with a short but steep side trip to Rankin House well above Ripley. We also were fortunate to see the bald eagle at the Brown County Water District flying back to its nest. And, to top it all off, we stopped in Point Pleasant, OH for the 191st birthday celebration of U.S. Grant, Civil War General and US President. I added 10 miles on the trainer early in the morning and another 10 that evening for a little over 120 miles for the day. I took it easy Sunday and today on the bike with just some recovery miles. Late today I did my one hour circuit class with plenty of core, foundation and strength work along with some plyometrics. I have some Climbing Repeats tomorrow, 5x6 minutes, 4 between but they're to be done on a flat road. The first 5:30 is at tt power (340-360) and then above 400 to finish, ideally. Next week si the first Cleves tt and second Blue Streak tt and then the Southwest Ohio Senior Olympics tt's on Friday with the 1 mile, 3k and 5k. Went to Sports Nutrition 2 Go today for the BodPod test. Three years ago I was at 166.8 lbs with 16.5 being fat or 9.9%. Today I was at 170.5 lbs and 15.8 lbs of fat or 9.3%. I added 5 lbs of muscle and lost one lb of fat in three years. I used the same course as yesterday and held 423, 411, 417, 409, 414, 409, 412 and 412. A little tired after yesterdays efforts and last nights 55 minute circuit class but still higher than in the past. There are time when I like doing these and times when I don't Today was a don't. hadn't had these on the schedule since January. I used my usual course at Ault Park starting at the bottom of the hill on Observatory and going to almost the back of the pavilion. While not fun I did hold better power than in january when I was in the upper 390's and low 400's Todays power was 470, 446, 444, 419, 426, 413, 425 and 408. My worst was better than my January best. But, these really hurt. Have another round tomorrow. I started today at 7:45 from our house in Gatlinburg with the temps in the 60's already. It was spring until about 3800' when the clouds rolled in. Around 5000' (Newfound Gap) the view up the road was limited to less than 100 yds and by the time I got to Clingmans Dome at 6300' the wind was blowing 40+ mph and temps were in the upper 40's. There were only two cars and one NPS truck in the lot. The NPS employee told me the wind was going to pick up into the 50-60 mph range. I decided to skip riding the 27 miles downhill into Cherokee, NC and instead headed back to Sugarlands where I rode towards Cades Cove. After 6:20 minutes of riding and just under 10,000' of climbing I had my 100 miles. Long day on the bike! I received this email from a woman who frquently attends my classes. Its important to note that she does the work and has earned these benefits. I just wanted to drop a word here to share something that you can appreciate and perhaps share with others in your instructions and coaching. As you may recall, I had a routine type of out-patience surgery last Friday, (women's issues) and of course it all went well with flying colors. My point here is to share the reactions of the hospital staff regarding my swift recovery. Judging from their reactions and comments, my post-surgery recovery was not your ordinary patient, for example when one of the nurses instructed me to go for the routine walk down the hall, I had already hopped up and was in a good pace before I realized that she had extended her arm to assist me. When she said to rate my pain on a scale of 1 - 10, 10 being the worst, I said that I honestly was not trying to act tough but that I had to say 0.25 (no meds). She laughed that she had never heard someone use a decimal. My oxygen was 100% the entire time. My BP was the only thing not so awesome, a bit high for me. Be that as it may, as they rolled me out of there, while chatting up a storm with the transport lady, another nurse said that I was their model-patient. I place all credit due to physical fitness and classes like yours that push us to a higher level. I mentioned the CSC and your classes. You talk about recovery in between intervals and such. It appears that my post-op was a fine example of benefits of our workouts, training and sports. You can encourage people with this example if you wish. Should they ever have to have surgery, your classes will help them immediately, yes immediately. This helps boost one's psychology and confidence too. Thanks Pete! As I feel today, I should be ready for this Sunday. M.B.C. Other than hitting some construction at the 2:30 mark this went pretty well. Average power was 345 for the longer portion. I may have stopped about 90 seconds shy of the 30 minutes. I know I can do better next time. Still, this is much better than I was doing 3-4 years ago. My out of competition power is never as high but I'm betting closer. Hr was just above threshold so I have more, just hard to call that up on my own. I did the outbound 30 minutes into a headwind. The power is much steadier on that one and higher at 317 average. HR was around 144. Coming back with the tailwind I was faster but power was more erratic and only 302. Did some more miles this morning before spin class and again late in the day watching the Masters. Heading to Tennessee on Wednesday for a few days. Hope to get in a century on Thursday and climb to Clingmans on Friday along with some hiking to check out the wildflowers. Waited until the weather warmed up a little and did 4x10 steady states. Power came in at 334, 332, 335 and then 323. Hit a light on the last one and had a flat at the end. Overall, right were I want to be at this time of year. Will likely get in a long ride tomorrow, hopefully 100 or so. Super windy night. During the warmup I had to get out of the aero position just to keep control of the bike (the new bike, the Giant Trinity Di2). Went off third since no one else wanted to volunteer. Didn't expect much and was only averaging about 24 mph after the first mile but ended up averaging over 27 mph and did the 10 miles in a little over 22 minutes. Not sure if it was the best time of the night but had to be close. Felt great on the new bike and overall I rode very well. Usually the first tt is pretty rough but I felt strong but with room to improve certainly. Should be a good year. All of those long tempo's and hours inside on the trainer and lifting are going to pay off. Started the day with a 10 mile indoor ride. It was still in the 30's so I didn't want to ride until it warmed up knowing we were headed for the upper 60's. Around 11am I rode the Mt. Lookout to Ripley and back century, the same as last weeks ride. Unlike last week, I didn't have any intervals in todays ride. 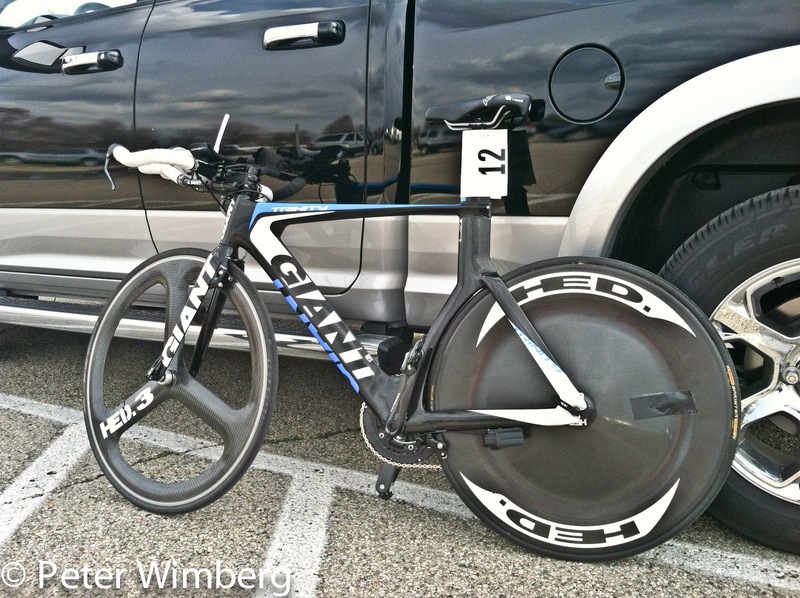 I had a headwind on the way out and ended up holding 235 watts for the 2:38 it took to do the 50.5 miles. 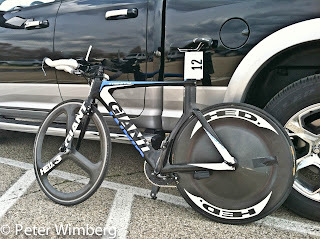 The way back was much faster at 2:23 with power around 214 for a total ride time of 5:02 and average power at 224. The time was actually a few minutes faster than last week under similar conditions but last week had the 2 x 60 minute tempo's. The last 10 miles was inside after dinner while watching NCAA basketball. The first time trial is this week in Dayton on Wednesday. The new bike, The Giant Trinity with Di2 shifting, will be ready. Going for a little less aggressive position than the Kuota especially in the drop from the seat height to the bars. On that bike I have about a 9" drop. It also has a long top tube so I have the seats as far forward as allowed by UCI rules. The Giant has a more forward (steeper) seat tube angle so that will bring me forward. I'll be able to generate more power in a less aggressive drop to the bars without sacrificing mush aero if any. I think I can keep the frontal area (the space between the head and arms) pretty clean and minimal. I was scheduled to do 4x6 but did 6x4.25 since the hill near our house works well for that. The idea here is to stay in the saddle at 50-55 rpm. Its kind of like doing leg presses on the bike. Cadence averages went from 49 to 57 and power was around 318 or so. Nice break from all of the tempo efforts. Today also included an hours spin class at 8:15 am. I taught but did not participate in the 9:15 circuit.